The first time I ever tried Chipotle, a smoke-dried jalapeño used primarily in Mexican inspired cuisines, was about a month ago at SaltRock Southwest Kitchen. Not being a big Mexican food eater it was quiet easy to have stayed away from chipotle for so long, though now I'm having regrets. The smokey, somewhat earthy flavor of chipotle is quite addicting. Chef Masssimo de Francesca, of Salt Rock Southwest Kitchen, turned me on to chipotle with his mouthwatering mini bell pepper appetizer. 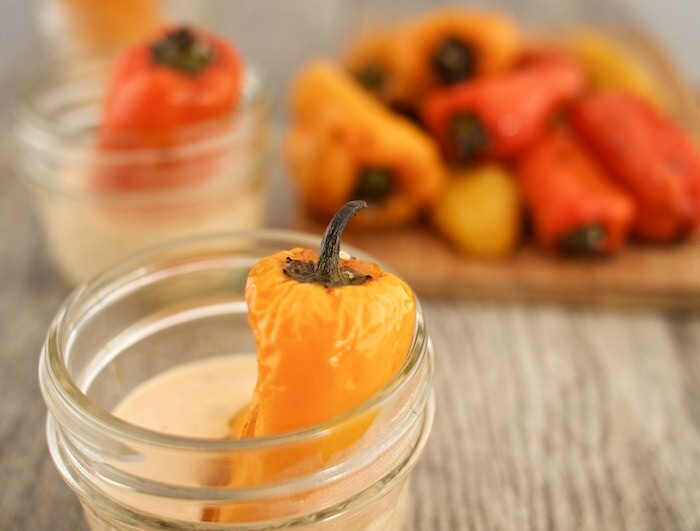 The peppers, which are smoked and then sauteed, are served with a chipotle aioli giving the dish a Mexican flare. It was love at first bite for me and these baby bells. I was excited when Chef said he would share his recipe. So, this past weekend my husband heated up the smoker for some brisket and threw a bunch of peppers on with it. I whipped up the chipotle aioli and served it with the peppers in individual dipping bowls. Needless to say everyone loved it! In a large bowl, toss peppers with oil and salt. Put in preheated smoker for 10 minutes. Alternatively you could char the peppers on a grill very briefly or smoke them on the grill for 3 minutes. Heat oil over medium heat, add garlic, onion and sesame seeds. Add peppers whole and saute until soft to touch with a fork. In a food processor or blender pulverize the can of chipotle peppers in adobo sauce and a small amount of water. In a small bowl combine mayonnaise and lemon juice. Add chipotle puree a 1/2 teaspoon at a time until desired taste. Add a few drops of liquid smoke and season with salt and pepper. That Aioli looks amazing! YUM! Thanks for sharing! I love those cute little peppers! And the aioli sounds amazing! I love baby bell peppers, what a terrific idea - sounds delish! we LOVE our peppers around here, and I have a stovetop smoker I could use to make these! I love the sound of all of it! Such a yummy snack! The chipotle aioli sounds delicious! What a great snack....that sauce though! Maybe I'll have a bowl of that, and a side of peppers? Those mini peppers are the best. What a great aioli to go with. We love cooking with those mini peppers. And that aioli sounds like the perfect kick to serve alongside them. We love mini peppers around here. And that chipotle aioli sounds like a winner! These sound so delicious! I always enjoy a smoky flavor but haven't ever done smoked peppers myself. And that aioli! Wow! I'm a HUGE chipotle fan. I feel like it adds so much great, smoky flavor. This aioli looks seriously addicting! What a great idea! I get those little peppers every week, but we always just snack on them raw. This looks way better! I basically want to eat this on everything. Mmmmkay? I love the look of this recipe and it would be easy to veganize by subbing vegan mayo. These mini bell peppers are so cute and colorful. I love the thought of plunging them in the chipotle aioli! Chipotle is one of my favorite flavors! It adds such a nice spicy smoky flavor to almost any dish. Dad lives mini bell peppers! Loving that Chipotle Aioli over here! Great little dip for them! Mini bells are the best. That aioli dip looks awesome! I MIGHT just make the aioli and eat it plain-yum!! I'll be honest. I have had aioli before but now I SO need to try this! These are so fun and sound delicious! Totally Pinning to make soon! Cute idea! Great as a harvest dinner first course! Mmm, I could eat this all day! Chipotle is hard to resist. This is such wonderful flavors! I love chipotle and I love bell peppers! Delish! It is no secret that I am a huge fan of the mini sweet peppers. I can't wait to try your recipe. LOVE the photos and love the recipe. Bell peppers for the win! I would never have thought to make something like this. Great recipe! This looks like the perfect football watching appetizer! My family (and friends) will love it! I work with all kinds of peppers. I love this aioli you have made. This could go well with so many different things.